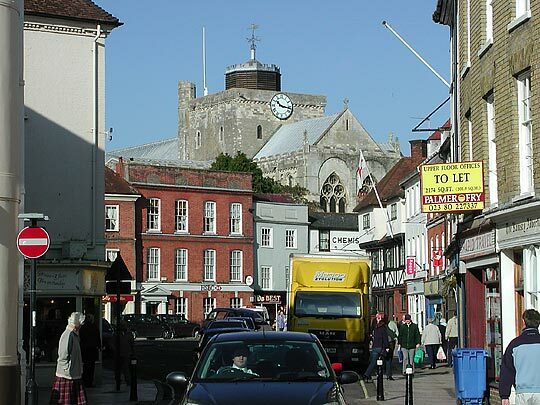 The first foundation of a nunnery at Romsey dates from 907. 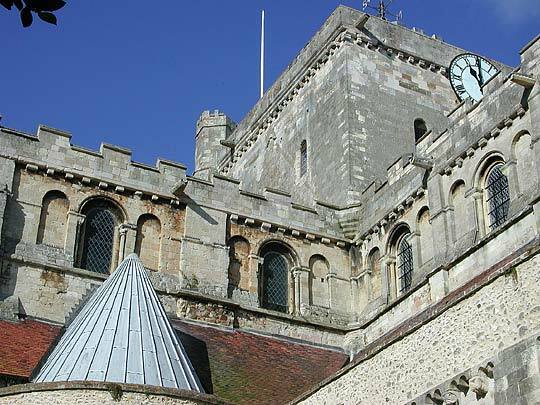 It was by Edward the Elder (son of Alfred the Great) for his daughter Elfleda. 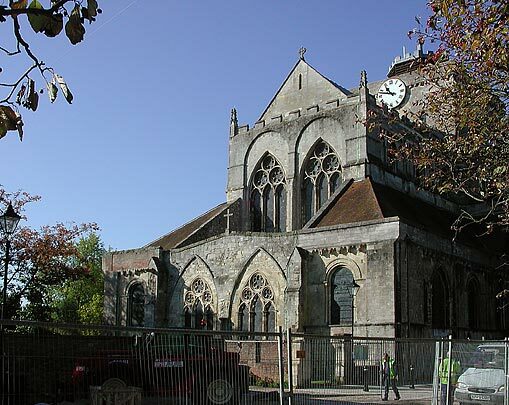 A second foundation became necessary in 967 ... A general rebuilding began about 1120 and continued to about 1230 ... At the Dissolution the church was bought by the town, and that has saved it from demolition. 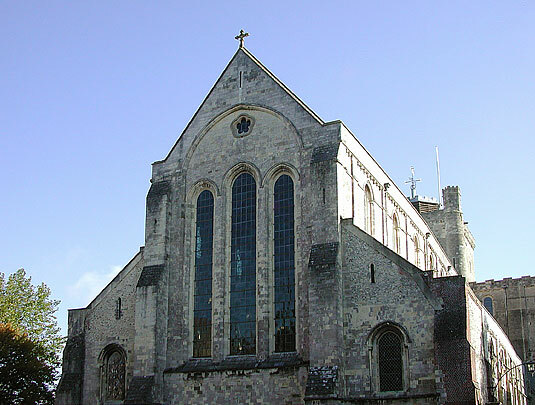 All the conventual buildings on the other hand were pulled down (except perhaps for one wall of the refectory inside a house S of the church; VCH). The E end is flat and clearly the result of two later alterations. 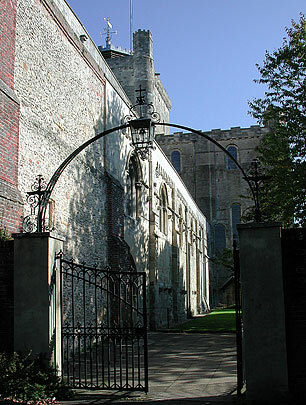 Of the Norman building (i.e. 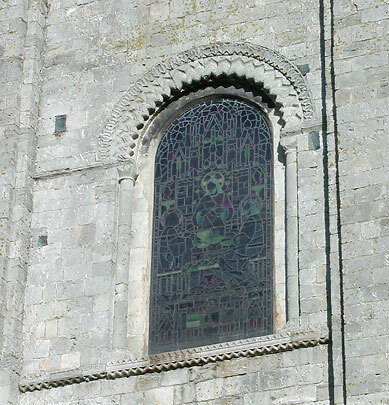 of the 1100s) the chancel aisle E window remains, with shafts and simple two-scallop and similar capitals. The arches have a big roll, the hood-mould a thin flat zigzag. 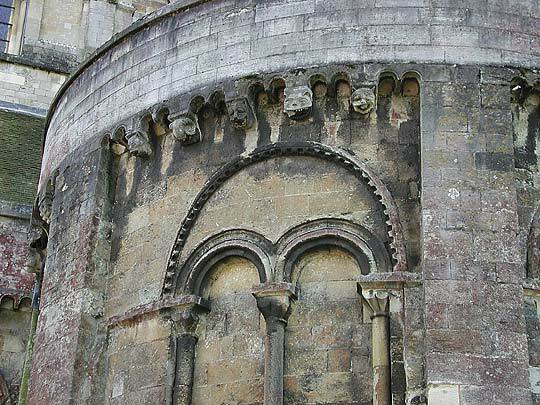 Corbel tables with heads. 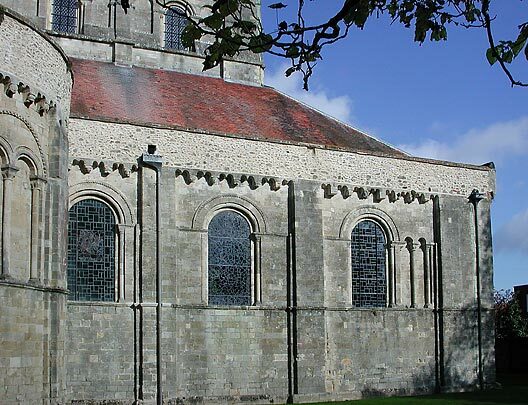 Between these two the width of the chancel was continued eastward. 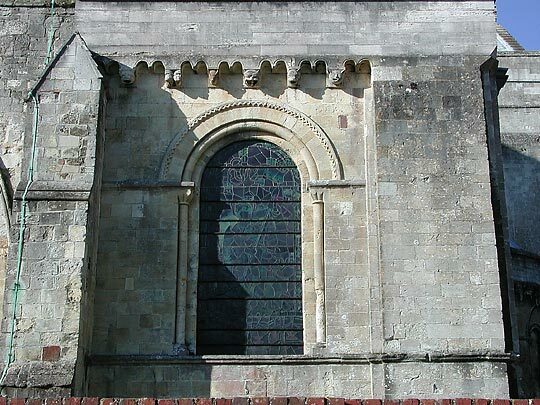 But of that externally only two blank arches tell. Inside the situation is clearer. 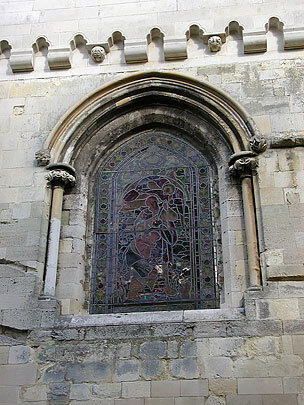 How this Norman chapel, probably the Lady Chapel, ended, we don't know - probably straight. Later, i.e. 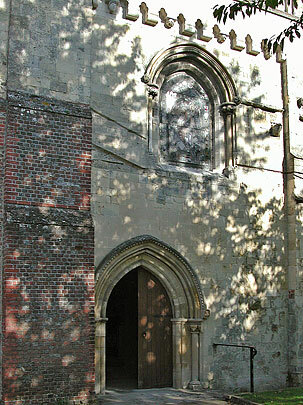 about 1270-80, this chapel was replaced by a new one. 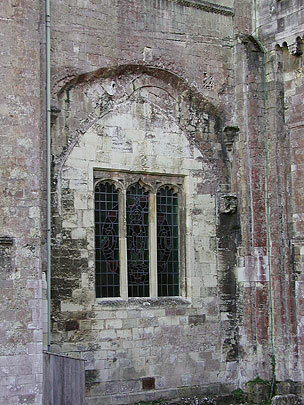 The wall shafts in the corners and the middle remain, but this second chapel has also gone. 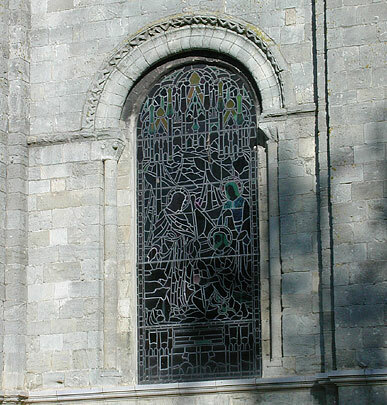 Its E windows were apparently set back when the chapel was demolished. They are of three lights and three circles over, two quatrefoiled, the top one sexfoiled. 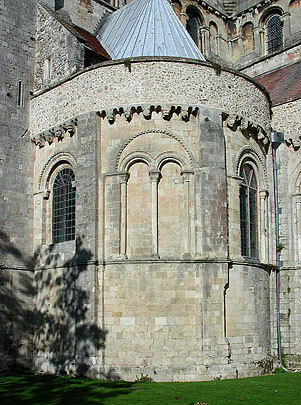 At the same time the chancel itself received two very similar but much larger windows, also of three lights, but with two sexfoiled circles and one large quatrefoiled circle. 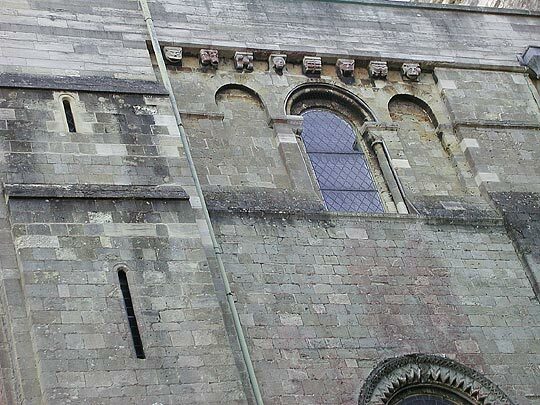 Up there also large blocked Norman arches appear. 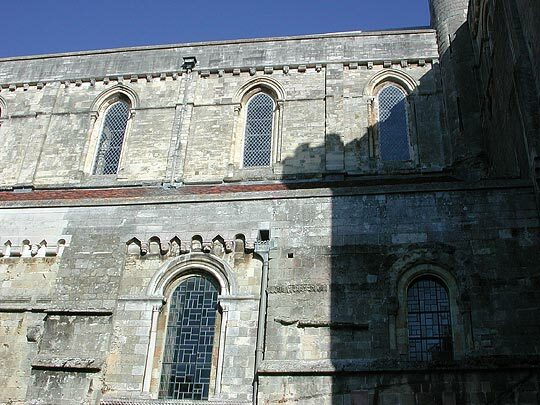 Round the corner, the S chancel aisle has an E bay with two narrow blank arches and then the first window, and then windows like the E window. Corbel-frieze also as on the E wall. 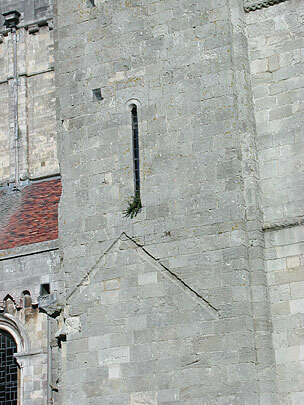 The capitals are mostly of two scallops, but also of primitive leaves. 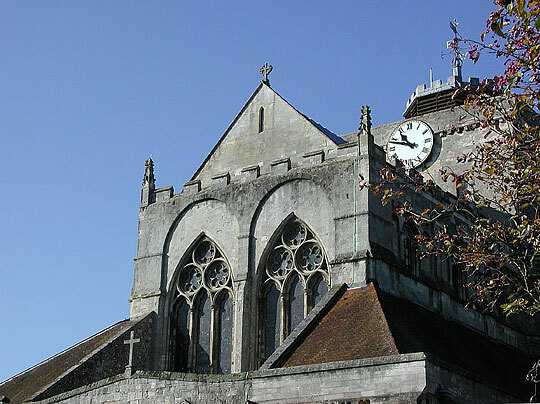 The clerestory is arranged in threes, two blanks and one window. Only the window is shafted. 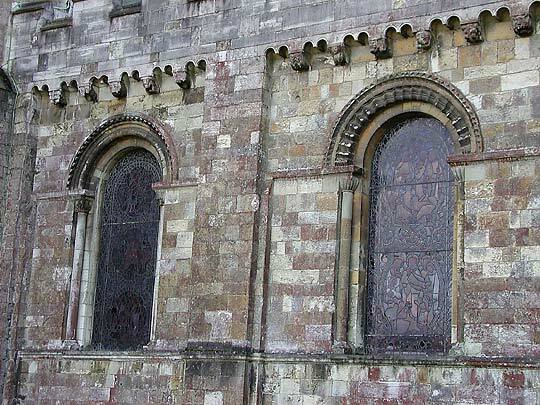 All this is the same on the N side, except that the W aisle windows have finer arch mouldings. 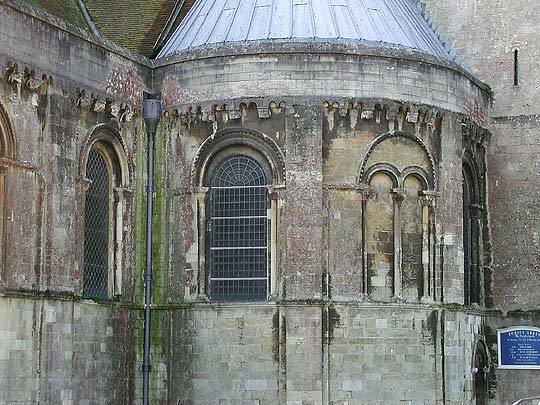 The transepts have an E chapel each which curves out apsidally, but instead of curving in again runs lamely against the chancel aisle. (South top row, north bottom row). 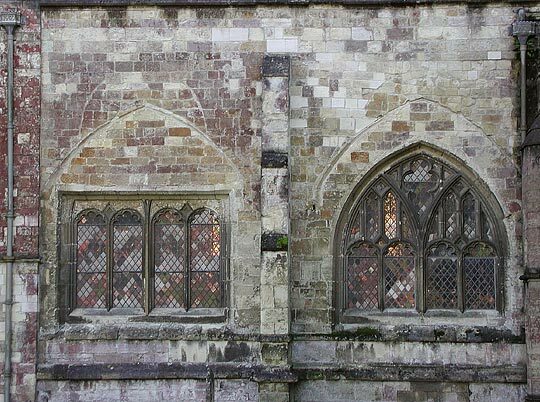 The chapels have a blank twin in the middle and one window l., and one r. Billet hood-moulds. 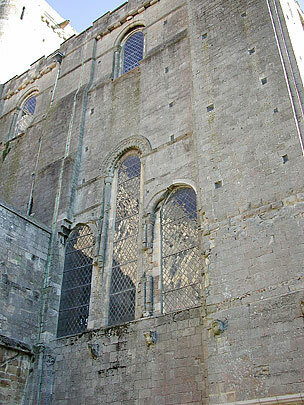 South transept above, north transept below, with close-ups of window stages in ascending order. 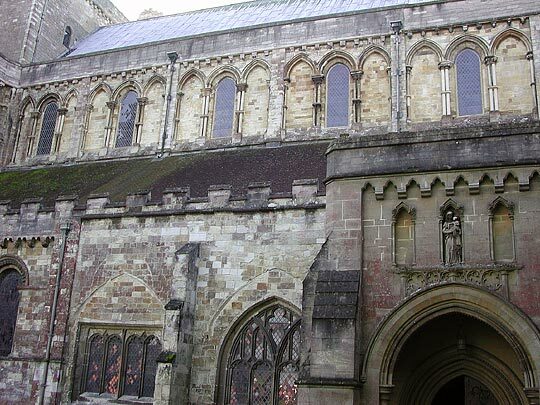 The end walls of the transept are very perfect. 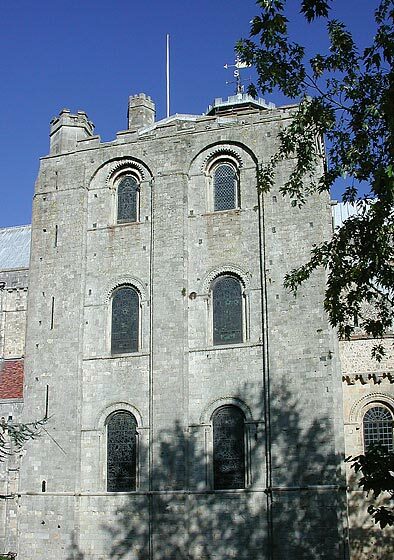 Two widely spaced windows in three storeys, with a middle buttress. 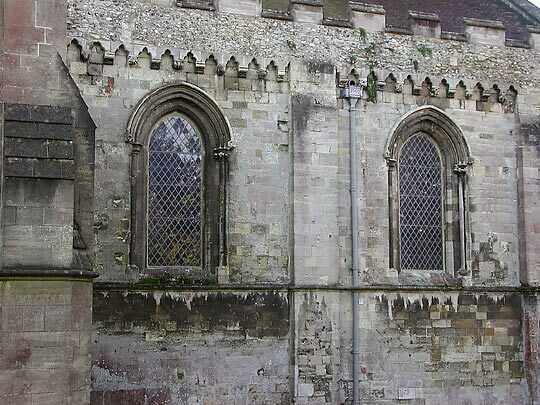 The only difference is that the N transept has in the gable a window with blank twin arches l. and r. Also on the ground stage a Perp window (15th century) was set in and a small Perp doorway with decorated spandrels. 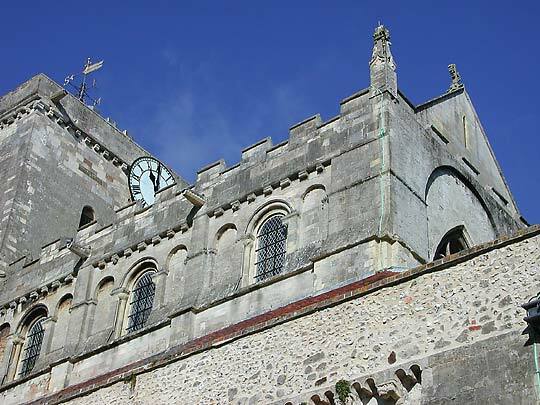 This is connected with the fact that the parishioners, who until then had been confined to the N aisle, were about 1403 granted the use of the N transept. 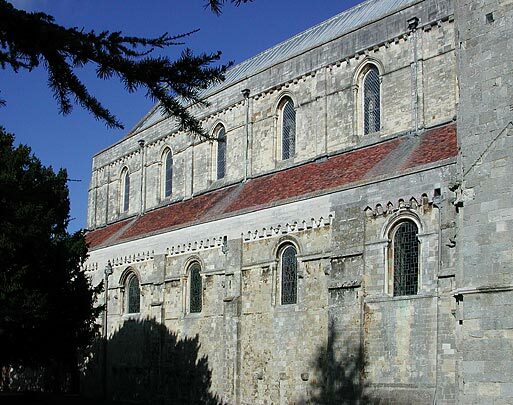 Which of the two transepts was built first, it is difficult to say. 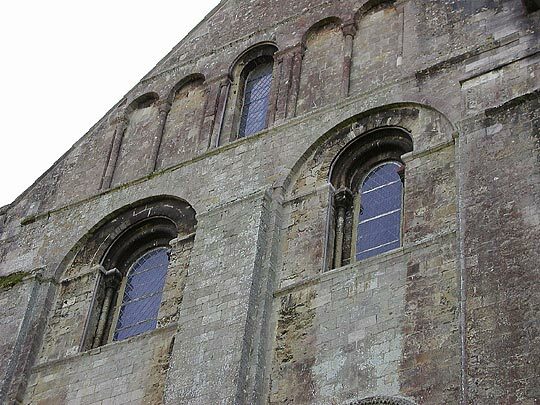 But as the S transept has big zigzag for the window arches on the first and second upper stages, and the N transept has not, one can deduce priority for the N transept. 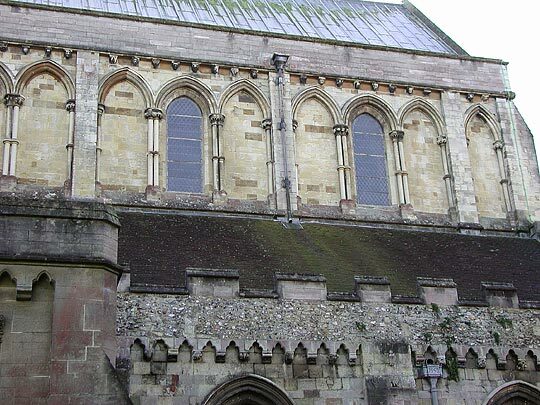 One very strange thing about the S side of the S transept is that no signs of the E range of the cloister buildings abutting on it exist at all. Can the slype have been so low and small and the dormitory have started only at the S of it? 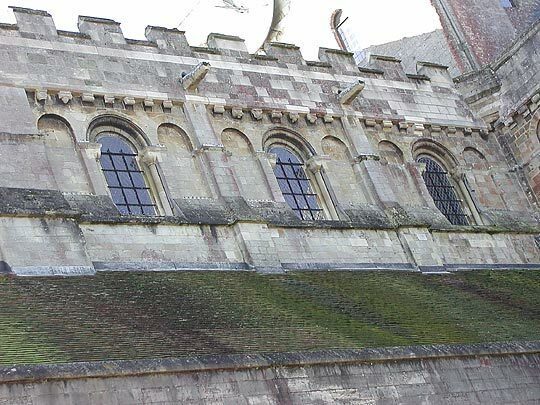 It is true that a small roof is outlined (upper row, last picture), but that is not enough for a normal cloister range. 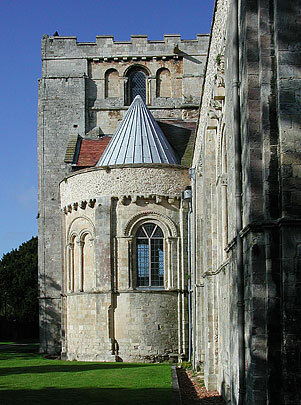 The W sides of the transepts differ more. 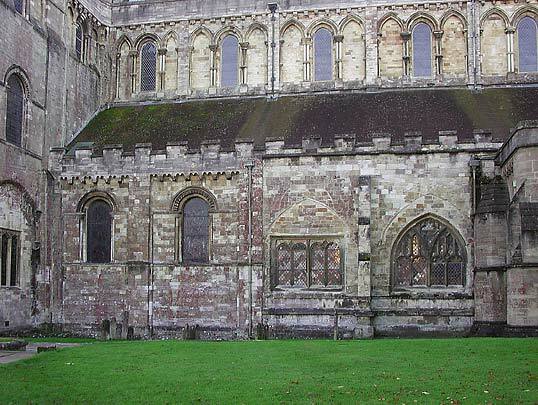 They have a large tripartite composition on the ground stage, But on the S side, because of the cloister, it starts higher up (first two pictures). 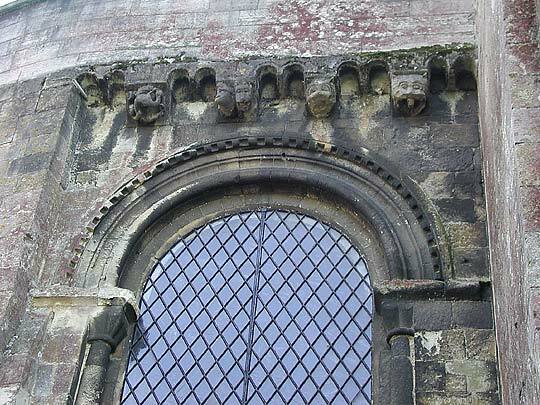 On the N side it is all altered Perp (third picture), though signs of the Norman work remain. The upper stages also differ, but not significantly. The first floor on the N side now has big zigzag too. 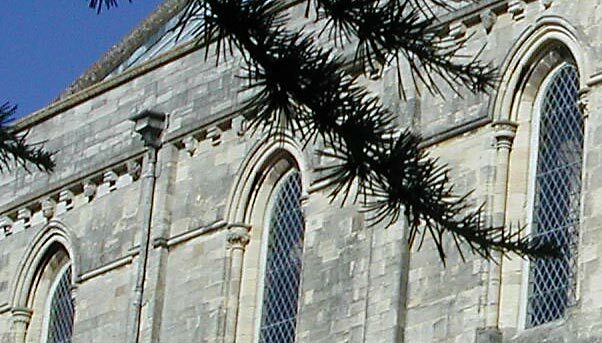 The famous Romsey Rood is outside the W wall of the S transept. The figure is about 6 ft 9 in. 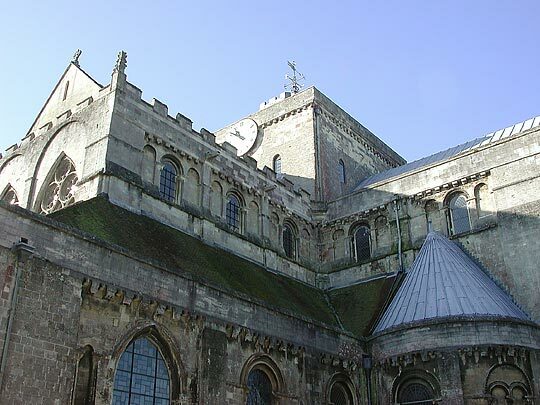 high, and the soft, a little undecided modelling is typically pre-Romanesque, or, in Continental terms, Ottonian. So the most likely date is the first half of the C11. Above Christ's head the hand of God shooting out of a cloud. Is this part somewhat re-cut? Now the nave. 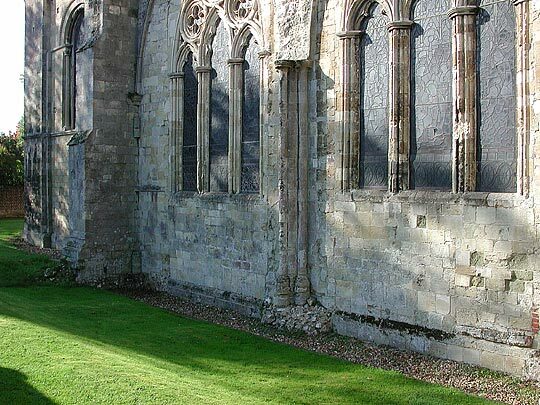 On the S side the aisle windows again have to take the cloister into consideration. 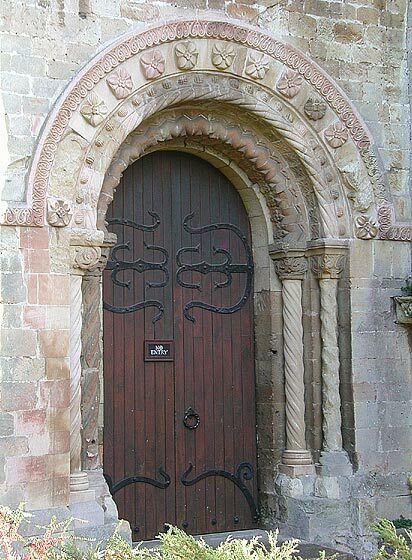 The usual doorway in the E bay is much richer than anything so far. 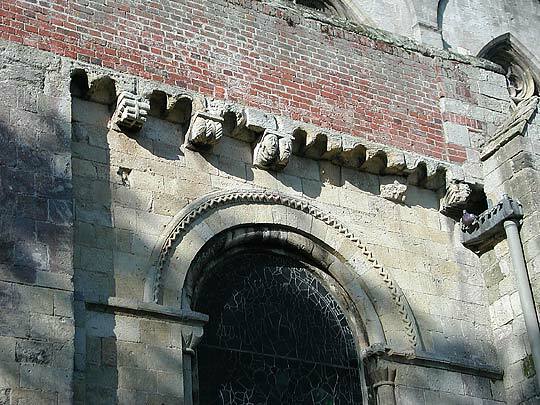 Two orders of shafts, capitals with trails, arch with zigzag, rope, a kind of raspberries, a paterae between arch and hood-mould. 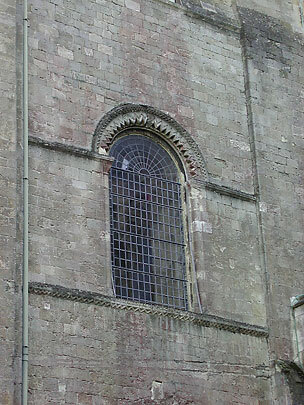 Small upper window. 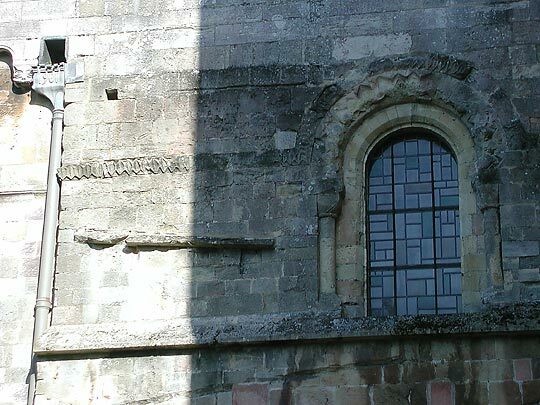 The following aisle windows are of the earliest type again, with roll mouldings. 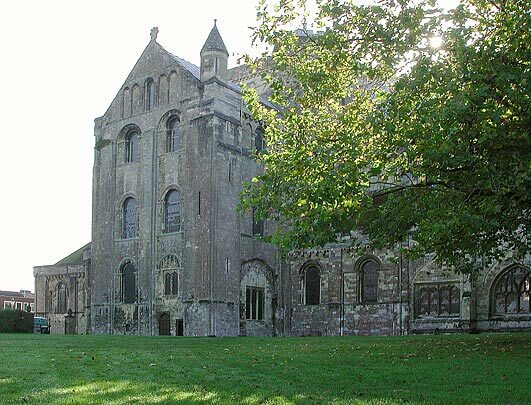 It was not unusual to build the choir parts and the S aisle wall at once, because of the cloister and the necessity of quickly providing some domestic accommodation. On the N side even bays one and two have zigzag at r. angles to the wall, i.e. 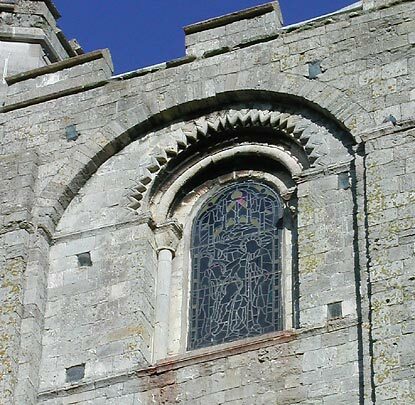 a Late Norman motif. (Not quite true - bay one does not have the zigzag). 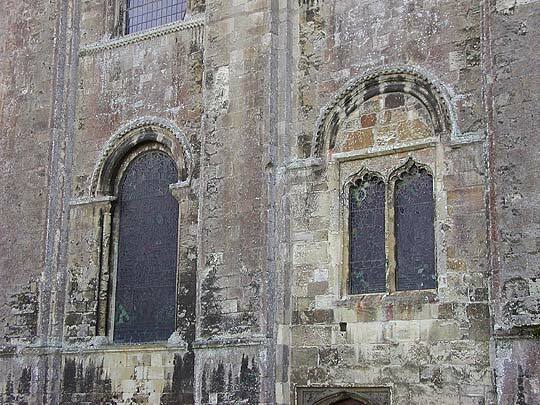 After that the windows are Perp, again no doubt in connexion with the parochial purpose of the nave. 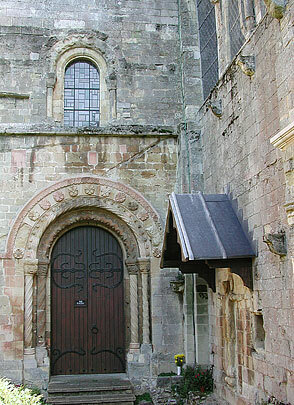 The N porch dates from 1908 and is by W.D. Caröe. 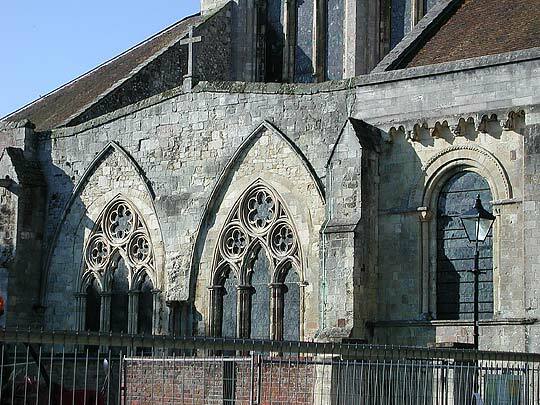 Further information kindly provided 2005 by Mr Stephen Stokes, Verger at Romsey Abbey: The first two bays from the N transept may look Norman but are in fact Victorian and were put in by the late Revd Edward Lyon Berthon in the latter part of the 19th Century. * Mr. Hubbuck doubts this. 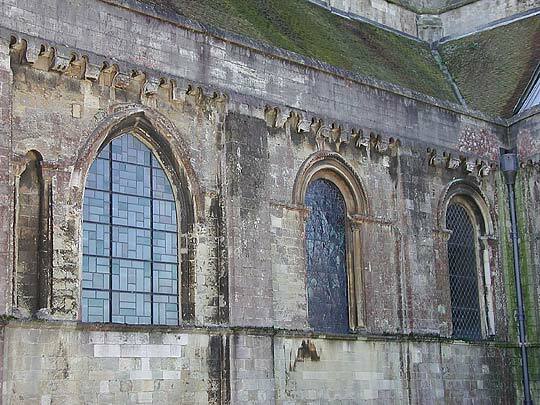 He suggests that the W window might be genuine and the rest by Ferrey. 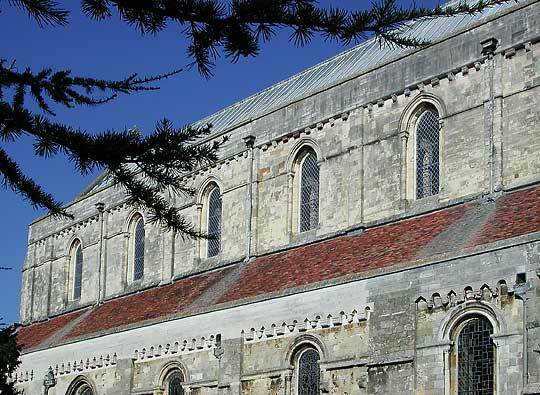 The nave clerestory deserves special attention. It is no longer Norman from the very beginning (not quite - see inside). On the S side it has one shafted lancet per bay. 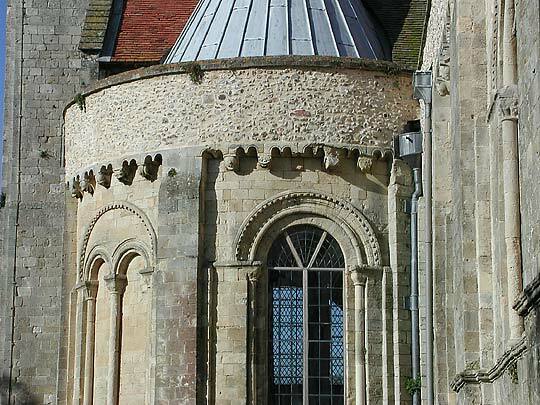 The capitals in the E bays however are still of Norman types, and only in the W bays stiff-leaf comes in. There are also different string courses. On the N side work obviously started later (see the observation on the aisle windows). 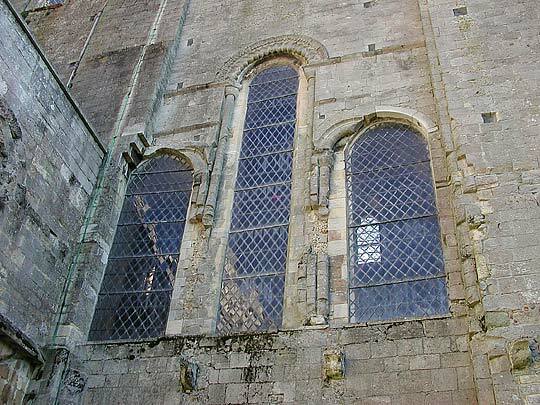 Here the whole clerestory has shafted tripartite arcading, with double shafts flanking the actual window. 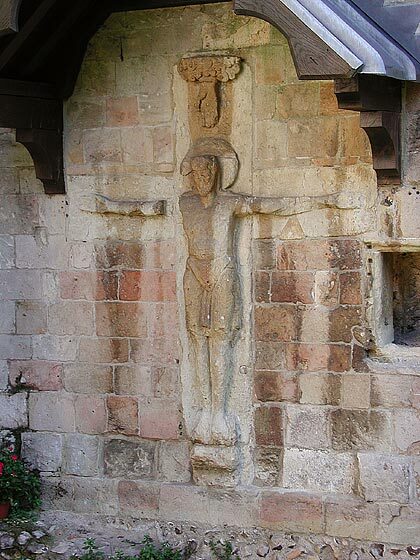 However, for whatever reason, the corbel frieze remains Norman in type. 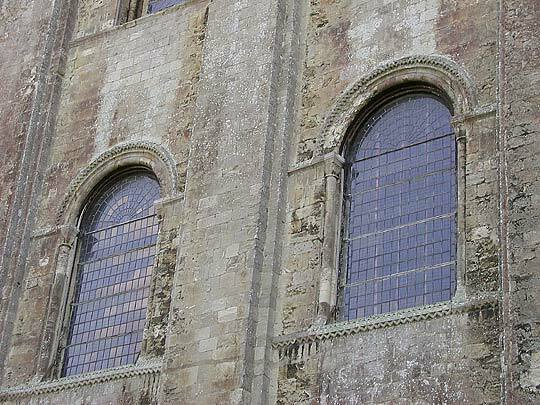 In the W bays, to return to them, even the aisle windows are now pointed and have stiff-leaf shafts. 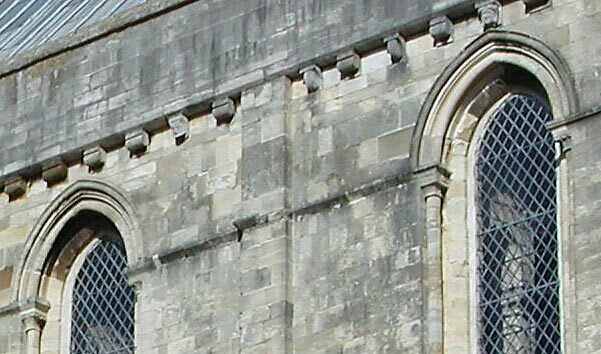 The corbel-table above them here changes to a pointed-trefoiled shape. 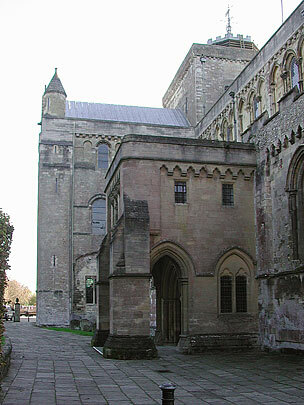 Finally the doorway from the W bay into the cloister. 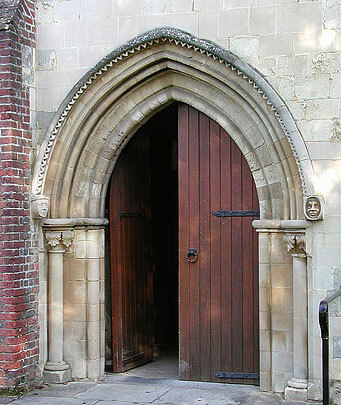 This again has stiff-leaf capitals, and an arch of many mouldings including a keeled roll and a roll with a fillet. Hood-mould with dogtooth. So one can see that the S aisle was proceeded with first and that the clerestory also was reached earlier on the S than the N side. One can also see that the W bays are the result not of evolution but of a total change of style. The interior will show all this more fully.